In order to buy Gyrados you have to first purchase 500 Magikarp. 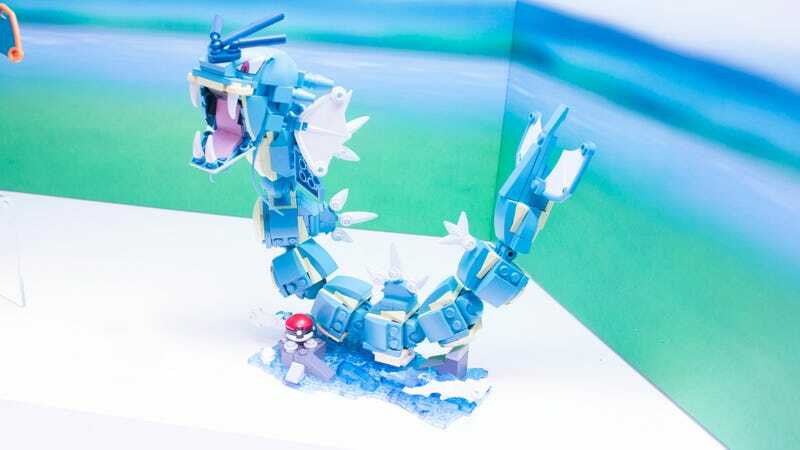 Announced last week in advance of the 2017 New York Toy Fair, Mega Brands has added Pokémon to its Mega Construx line, with sets coming this fall. I got a chance to snap some of them during Mattel’s Toy Fair event, and they aren’t too shabby. They’ve got basic Pokémon in plastic balls, which are pretty easy to get behind. For a guy made of bricks, that’s pretty accurate. Eevee devolved a little bit. Somehow I will end up buying a dozen Zubat and naming them after song lyrics. The smaller guys are also available as part of battle scene sets. I am not ooking up the weakness chart to make a snide comment about this battle. Stepping up we’ve got the middle evolutions of the original starters, complete with fancy accessories. Wartortle doesn’t get enough love. And finally there are heavy hitters like Charizard and Gyrados, bug guys with big hearts and big price tags. So what do you guys think? Cool enough to get you into the toy aisle, or pass?